Film review and thoughts – “Deepwater Horizon” by Peter Berg, 2016. 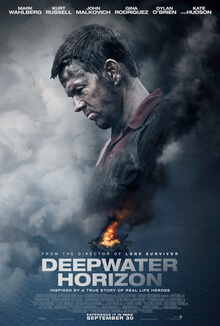 This movie is about the explosion of the Deepwater Horizon platform and the oil spill that happened in April 2010 in the Gulf of Mexico, off the coast of Louisiana. The whole movie revolves around the events occurred before the explosion and around the moment of the explosion itself, which is good because it gives the spectator an idea of how the oil industry works and of how the different actors relate to each other. Nothing is shown about the days after the collapse of the platform, so the consequences of the disaster remains to discover by other means. Having very little knowledge about this envirommental disaster before seeing the movie, I was able to watch it with an objective approach, and it provided me with a lot of food for thought. Moreover, even if it is a movie with some scenes being necessarily a bit emphasised, I think that it nonetheless provides a good picture of the extractive industry world. First of all, at the social-human level, the movie emphasises the considerable difference in human interactions and behaviours between the oil workers and the two BP managers. On the one hand, workers on the platform are well aware of the importance of having all the infrastructure set up perfectly, they know that it is risky to start drilling without being sure that the installation is not defective. On the other hand, the BP managers only think about the profits, about sticking to the schedule, so they want the activity to start as soon as possible, regardless of the safety condition of the installation. There is a wide gap of practical knowledge of the “oil production” mechanisms and functioning, between the managers and the platform workers. Not only are the former unconscious of the risks of drilling without having tested the cement in the seabed, but they don’t seem to even think about the possibility of the cement being defective and potentially causing a disaster. A second thing I learned thanks to this movie is how complex the oil industry is, whether we talk about the actors and companies involved or about the production steps. In fact, this movie features many different actors: BP managers, the cement testing team, the company exploiting the platform on behalf of BP, oil workers. Given that the priorities of each group differ, cooperation between them is difficult and ultimately the more powerful BP managers manage to impose their view on the oil workers and coordinators, allowing the disaster to happen. Finally, one thing that surprised me (but at the same time I expected it to be so), is that men dominate the oil industry. There is literally only one woman working on that platform. In the map below, you can see how much the oil spread in the Gulf since the explosion on April 22th to May 1st, when the spill reached its biggest size.